Due to our 2 freakish snowfalls, the planting season for this year is about a month behind schedule. This is fortunate, because I am always late as it is anyway. So, instead of my regular Valentine’s Day tater planting, this year, I planted about 3 weeks late. Typical planting dates for taters in my zone is February 15th to March 1st. The thing is, is that Irish ‘taters don’t like hot weather; they develop best on warm days and cool nights. So, the concern with them (and many of the other veggie varieties that prefer this weather) is that there will not be enough days of this weather/daylight length for the veggie to produce before our notoriously hot weather sets in. Once the hot weather sets in, the taters are done producing. So, it will be interesting to see what kind of crop I get this year. Last year, I harvested approximately 10-15 pounds of taters per 4’x8’ bed. Not a huge number, but I assure you, it was more than enough to last us until fall! Just remember before planting anything to check your recommended planting dates for your area (!!!!!). This year, I planted differently than ’09. 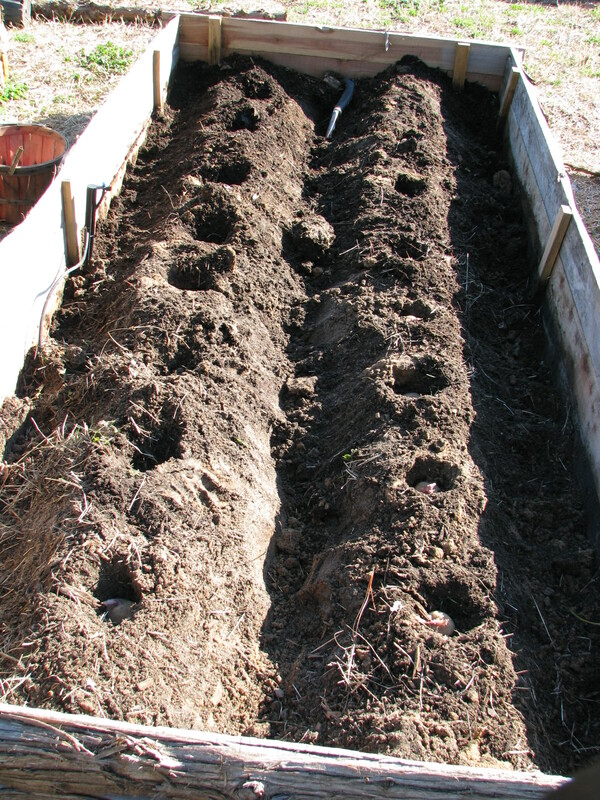 In ’09, I dug 2 trenches in the beds, laid my little taters down in the trenches, about 10 inches apart and covered them with soil. As the plants grew, I mounded soil, and then straw at the base of the growing green tops, because the tubers (read: taters) grow along the stem, as long as it is shielded from the sun. So, this year, I made 2 long rows, dug a 4″ deep little hole, and put in the taters, and covered them up. As the stems/leaves emerge I will cover them with either straw or mulch to protect the baby taters from the sun. Also note that I have rotated my beds..I am not planting the same veggies in the same bed that they were in the previous year. You should ideally have a 3 year (or longer) rotation on your beds. For example, let’s say in Bed #3, I will plant tomatoes this year. I will not plant tomatoes in that bed again for at least 3 years. This helps to prevent certain vegetable specific diseases/nematodes/etc from building up in the soil. What happens is that your crop will steadily diminish in quality and quantity over time. Here’s my very quick How-To. Since I didn’t save many taters from last year, I bought ‘seed potatoes’ from the feed store. These are small to medium potatoes from which your own plants will grow. I cut the taters (well, Jason did it this year) into hen’s egg size pieces, making SURE that there is a good ‘eye’ on each piece. Here is a piece of a seed 'tater with a great eye. The eye will develop into the aboveground plant. The new tubers/taters will develop below. 2 Rows of taters. I planted each piece about 3-4" deep and about 8 inches apart. This year I planted Kennebec Whites and Yukon Golds. Now it’s just up to Mother Nature! Well, and I guess me, just a little bit. I have to make sure I don’t let them get too terribly dry. So, come about June, I hope to have lots of taters. As you can tell, I do not agonize over how to plant my vegetables. I DO research, of course, but I don’t agonize over all of the numbers, and facts and figures for the most part. Some plants can be rather picky, and some plants you can pretty much throw on the ground, and they’ll grow. As you garden and have your own successes and failures, you’ll get more comfortable about what is important and what really just isn’t. 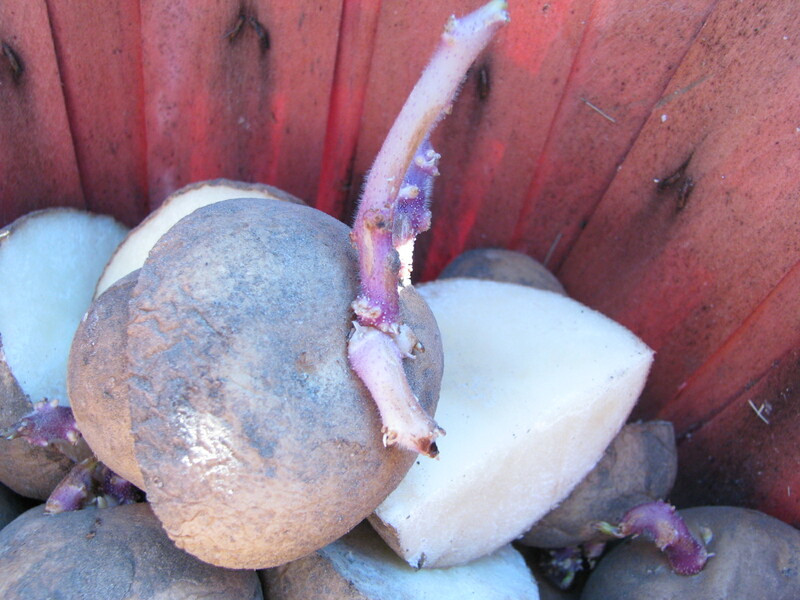 Regarding seed potatoes, you can grow and keep your own. I plan to keep some medium and small potatoes this summer just for this purpose, and I will plant a fall tater crop around the first of September. I have read it is recommended to not cut these, but to plant them whole.